The wait is over; the much-anticipated Chevrolet Cruze hatchback is here! At the end of September, the new and improved four-door hatchback is due to roll into dealerships. Since the introduction of the redesigned Chevrolet Cruze in early 2016, summer sales have increased significantly and the upcoming hatchback is sure to impress! Similarly, the Chevrolet Cruze sedan and hatchback models are powered by a four-cylinder, 1.4-liter, turbocharged engine. With six-speed manual or automatic transmission options, the Cruze is a solid choice for the commuter. As described by General Motors of Canada, "It also comes with a full range of safety features usually found on more expensive luxury cars such as dual air bags and side air bags. Its rigid "safety cage" has reinforced pillars with tubular bars that provide optimum protection in the event of a collision. In addition, the Cruze has the most powerful diesel engine in its segment. The quiet diesel power plant generates 166 ps of power." The Cruze features an impressive display of 21st century technical and safety features including: back-up camera, navigation from telematics, automatic headlights, Bluetooth connection, engine immobilizer, security system, stability and traction control, and more! The all new hatchback design is sporty and practical, boasting a roomy interior, comfortably fitting 4 adults, extra storage and a sleeker style to that of its sedan counterpart. 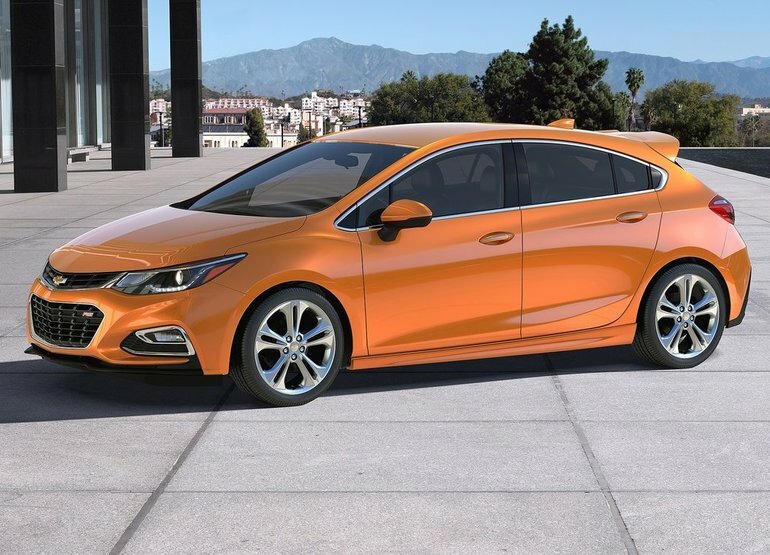 The hatchback runs the same turbocharged engine as the redesigned Cruze with 153 horsepower, but "independent rear suspension [now replaces] the sedan LT's more rudimentary beam-axle design," notes Car and Driver. The hatchback also provides extra cargo space, allowing for 1,336 liters (47.2 cubic feet) of storage when the back seats are folded down. With an average rating up to 7.4L/100 km fuel consumption (6.4L/100 km highway and 8.3L/100 km city), the new Chevrolet Cruze hatchback also offers peace of mind for the fuel-conscious consumer. Overall, the new hatchback provides a practical option for the sophisticated commuter. The sleek design, comfortable interior, economical fuel consumption, updated technical and safety features, and ample storage space is sure to satisfy. Contact us to learn more about the new Chevrolet Cruze hatchback.